File Sync Software. Synchronize files between multiple computers via USB. File Sync Software. Synchronize files via USB. USB Sync for files and folders. Plug2Sync and Backup is the latest synchronization software released by 4Team and it has been created to offer an easy and efficient solution for synchronizing files. In case you use multiple computers or devices which use Microsoft Windows, such as desktops, laptops, netbooks or Windows tablets, Plug2Sync and Backup can make life easier for you. You can now synchronize your computers easily via USB and quickly transfer from one computer to another the data that you use often or that you want to have accessible to you at any time. Plug2Sync and Backup is a unique PC sync software because it makes everything seem simple and it can automatically sync files and folders in real-time with your USB device. All you have to do is plug in your USB device, for example an external hard drive, USB flash drive, or any other device that you can connect via USB, choose which files and folders to synchronize and press the button to start the data synchronization. If you want to synchronize the data with another computer - either desktop, laptop or netbook - you can then connect the USB device to the second computer and run Plug2Sync and Backup to get all the files synchronized between your USB flash drive or external hard drive and your computer. While the USB device is plugged in, data synchronization between the selected folders continues in the background, so any new changes made to the files and folders will be saved. 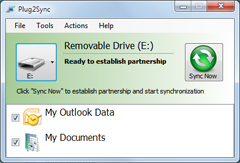 This makes it easy to sync PCs and keep files in sync, and it can be especially useful in situations where you need to transfer updated files and folders from computer to computer because Plug2Sync and Backup uses an automatic sync process that detects any changes made and automatically synchronizes the updated data. Using a file sync software is an easy way to keep your computers synchronized, and whether they are desktops, laptops, netbooks or even the latest Windows 8 tablets, our synchronization software, Plug2Sync and Backup, works smoothly and fast. In this way you won’t have to go through the long-lasting painful process of making manual changes for every computer and you can have it all done for you automatically. File sync between PCs, laptops, Windows 8 Tablets and any removable storage devices. If you are looking for a PC sync solution that can synchronize files and folders between your PC, laptop, netbook, removable storage devices, or even brand new Windows 8 tablet - Plug2Sync and Backup is the answer. Using this file synchronization software you can easily transfer data between your computers and removable storage devices and keep your files and folders synchronized. Whether you are looking to sync files between two or more computers, sync laptops, sync your laptop with your desktop computer or with your netbook, you can do this easily via USB. You can also just use Plug2Sync and Backup to synchronize multiple files between your computer and any removable storage devices you may use, such as external hard drives, phones, tablets, mp3/mp4 players, etc. In this way you can transfer documents or media files to your USB devices automatically whenever they are plugged in. Sync bookmarks and favorites. Synchronize bookmarks between multiple computers. Plug2Sync and Backup solves another big problem that many users encounter: it can synchronize all your bookmarks and favorites across multiple computers. If you use multiple computers, for example at work and at home, you can now easily sync bookmarks and favorites between them using a USB device. Using Plug2Sync and Backup you will not only be able to keep your bookmarks and favorites synchronized on your computers, but also you can share them with your friends and colleagues because all it takes is to plug in the USB device.